Wise Guys is a 1986 black Mafia comedy film directed by Brian De Palma and produced by Aaron Russo from a screenplay written by George Gallo and Norman Steinberg. It stars Danny DeVito and Joe Piscopo as two small-time mobsters from Newark, New Jersey, and features Harvey Keitel, Ray Sharkey, Lou Albano, Dan Hedaya, and Frank Vincent. Italian American Harry Valentini and his Jewish friend and next-door neighbor Moe Dickstein occupy the bottom rung of Newark Mafia boss Anthony Castelo's gang. Making a living by doing Castelo's lowest jobs (such as looking after his goldfish, testing out bullet-proof jackets, or checking the boss's car for bombs) the two men dream of opening the world's first Jewish-Italian delicatessen. However, they get little to no respect from their boss or his subordinates, who frequently ridicule them. They accompany Frank "The Fixer" Acavano, one of Castelo's top men and a violent, heavyset psychopath, to Meadowlands Racetrack to place a bet on Castelo's behalf. Valentini changes horses at the last minute because his boss usually bets on the wrong one. However, this time Castelo had fixed the race, meaning that Harry and Moe now owe their boss thousands. After a night of torture, both are forced to agree to kill each other. Unaware that each has made a deal and frightened following the murder of Harry's cousin Marco, they steal Acavano's Cadillac and travel to Atlantic City to see Harry's uncle Mike, a retired mobster who started Castelo in the crime business. After using Acavano's credit cards to pay for a luxury stay in a hotel owned by their old friend Bobby DiLea, the two go to Uncle Mike's house to ask for help. They find only Uncle Mike's ashes, leading to Moe leaving in disgust. Grandma Valentini, however, is able to give Harry the money he owes. Harry tries to get DiLea to sort things out with Castelo. As he and Moe leave the hotel, their limo is being driven by Acavano, after DiLea appears to double-cross the two. Harry luckily spies Castelo's hitmen and decides to stay behind and gamble the money. After a chase through the hotel casino, Moe catches up to Harry and accidentally shoots him. Harry is pronounced dead and Moe flees. Back in Newark, Moe hides out of sight at Harry's funeral. He is spotted by the huge Acavano (who is eating a sandwich during the burial service) and Castelo resolves to kill Moe after the service. Moe returns to his house and prepares to hang himself. Before doing so, sees a vision of Harry at the foot of the stairs. He quickly realizes that it is actually Harry, who arranged the whole thing with DiLea. Moe is thrilled, although he is so shocked that he is almost hanged anyway until Harry intervenes. Harry provides a skeleton for Moe and they write a suicide note before turning on the gas and setting fire to the curtains. As the two leave Moe's house, however, the door slams shut and puts the fire out. Castelo and his men enter to find a bizarre scene. Castelo takes out a cigarette, prompting his stooges to routinely spark their lighters for him. Acavano asks "Who farted? ", prompting Castelo to realize the house is filled with gas just before the house explodes, with the crew inside it. Harry and Moe return to Atlantic City, where Moe bemoans the fact that they didn't keep the money. Harry informs him that he did save the money, but has invested it. Moe seems perturbed, but the film ends with their dream realized as the two stand in their Jewish-Italian delicatessen. The film received mixed to negative reviews from critics. A positive review came from The New York Times, with Walter Goodman calling it amusing and fresh before concluding that "Everything works." Roger Ebert was similarly enthusiastic, writing "Wise Guys is an abundant movie, filled with ideas and gags and great characters. It never runs dry." As of May 2016, the film has a 31% "Rotten" rating on Rotten Tomatoes. Matthew Kaye as Harry Valentini Jr. Wise Guys Was First Release on VHS and Beta Around 1986 From CBS/FOX Video. 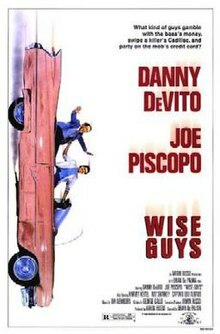 Wise Guys was released to DVD by Warner Home Video on August 30, 2005 as a Region 1 widescreen DVD and fairly recently as a DVD-on-demand from Warner Archive Collection available through Amazon.